All mariners are hereby advised that scheduled dredging activities will be taking place at the Conwy Harbour access jetty (opposite the Liverpool Arms) for the next two to three weeks. The work boat ‘Jac y Do’ will be restricted in her ability during dredging operations and mariners are requested to keep 25m clearance. Should jetty access be required during operations then the vessel should be contacted on VHF channel 14. A further notice will be issued when dredging operations are complete. All mariners are hereby advised of the following message relating to Conwy Marina issued by the Marina Manager. Please be advised that we have recently severed an electrical cable to the sill gate traffic lights and proximity sensors which has now resulted in them being inoperable. Aid to navigation Llanddwyn Island “South East Rock” south cardinal, usually in position 53º 07’.820N 004º 25’.040W is not on station. For further information and updates, visit the Caernarfon Harbour Trust website. 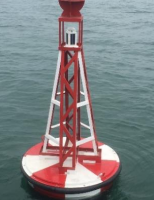 Caernarfon Bar – Aid to navigation Fairway Buoy L FL10s, usually in position 53º 06’.45N 004º 25’.001W is not on station. The Aid to navigation has been temporarily discontinued for the winter. 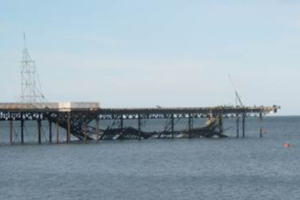 All mariners are advised that a further section of Victoria Pier Colwyn Bay, position 53 17.80 N 003 43.42 W, has collapsed. Debris has been sighted in the water and all mariners are advised to maintain a safe distance from the structure. Attempts will be made to recover any lose debris from the coast when weather conditions permit. All mariners are hereby advised that Victoria Pier (53º 17.292’ N 003º 49.705’ W) at Colwyn Bay has partially collapsed into the sea. Debris is floating in the vicinity of the Pier and mariners are advised to maintain a safe distance from the pier. Mariners are also advised to maintain a good look-out for partially submerged debris if navigating within the Bay of Colwyn. All mariners are advised that local notice to mariners 11/2016 is hereby cancelled. The pontoon sections have now been recovered and the isolated danger mark removed. Mariners are hereby advised that a special mark has been laid, situated between the Beacons Jetty and Conwy Quays Marina. Berth holders are advised that, with immediate affect, sill gate operations will not take place during the hours of darkness and during any severe inclement weather. Vessels wishing to access or egress the marina during this time are asked where possible, to navigate close to high water with the gate in a raised position and to contact the Marina for depth clearances. Vessels wishing to access or egress outside of these hours are asked to request a gate operation giving as much notice as possible. Reducing sill gate operations during the quieter winter months has proven to help significantly reduce the levels of siltation in the marina during these peak months and we thank you for your continued co-operation.